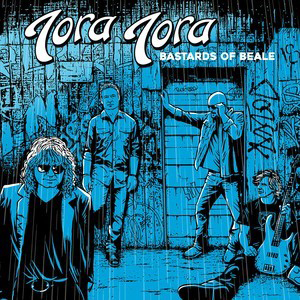 The first TORA TORA release of any kind in nearly eight years, the new studio album Bastards of Beale finds the band (singer Anthony Corder, guitarist Keith Douglas, bassist Patrick Francis and drummer John Patterson) in fine form. It's been more than two decades since their Surprise Attack heyday with a split, eventual reunion and a bevy of releases (including the 2011 release of their long delayed 3rd studio album which was originally recorded in 1994), but time hasn't seemed to taken some great toll on their sound. As strongly hinted at, given the album's title, the band's music is steeped in the southern bluesy rock sound in general and TORA TORA's Memphis roots in particular. The album opens with the energized rocker "Sons of Zebedee". The pace is lively and overall the song is a great way to kickstart the album. I think the only thing that kept me from fully embracing the song as a whole was the title. I thought "Zebedee" sounded a bit silly. Of course, I didn't know where the word came from beforehand, but after I looked it up, I was probably the one looking a bit silly. However, after that song, the rest of Bastards of Beale was rather outstanding! "Giants Fall" has a crushing rock sound in the song's intro and then the rocker just burns white hot for the entirety of the track. I also really loved the guitar work from Keith Douglas on this track. The lines and the solo were fantastic and really helped sell the song to me even more. The band has a sweet rhythmic swinging style on the fast moving "Everbright". Even their instrumental "Vertigo" was a standout track, leading into the blazing title track that closes out the album. The song has a lot of repetition in the lyrics and that would normally tend to annoy my musical sensibilities but here, it works perfectly. Unsurprisingly, the majority of the songs would fall on the harder rocking side of the ledger, but on the slow burn number "Lights Up A River", the intensity that fuels the song quickly removes any worry over the song being a run of the mill ballad type track. The story in the lyrics has a sense of the gothic to it and makes this a very interesting track to listen to. If lyrical content is your thing, like it is for me, you'll also enjoy "Silence The Sirens". The song rocks out but it also features a set of lyrics that I found myself becoming more involved in listening to with each successive spin of the album. One note about the lyrics I should mention. If you are like me and like to read the lyrics in the liner notes as you listen to an album, you will find yourself a bit more than frustrated with Bastards of Beale. This would be what is printed in the liner notes is not quite accurate to what is being sung on the album. There's a lot of either adding or cutting out words that make reading the lyrics an adventure. Or in my case, got me just a little annoyed. Of course, if you just want to rock out with reckless abandon, songs like "All Good Things" and the stunningly good "Rose of Jericho", are probably going to resonate with you a lot too. However, I'm going to lay down money on the song "Son Of A Prodigal Son" being the best track on this album. It is a flat out killer example of great songwriting. There's a bluesy drawl at the start of Anthony Corder's vocal turn and then when the band works a more explosive rock feel into the mix, the song just further takes flight to the point where you feel a kind of disappointment when the song eventually comes to an end. For the most part I enjoyed the Surprise Attack album when I finally got to listen to the whole thing for an article I wrote on it last year. That said, TORA TORA comes out firing on this album, fueled by great songs, killer musicianship and a heavy but not overwrought sense of pure blues-influenced rock and roll. It will not surprise me in the least to see Bastards of Beale come to be seen as the best album they have ever done.